ObamaCare’s imprudence becomes more evident every day, most recently with the announcement that the administration was forced to waive one of its onerous new regulations so that up to a million workers don’t lose their health insurance. Those of us who understood the economic disincentives that the health overhaul law set up warned of the dislocations it would create. And while we are glad these workers have been given a one-year reprieve, it also is a symptom of the power plays that were part and parcel of ObamaCare’s passage. Public outrage over the Cornhusker Kickback, the Louisiana Purchase, the U-Conn, and other special deals in the Senate nearly killed the bill. But now we are seeing the deals at a new level: People who have lobbying power are able to get relief from the regulatory guillotine. We’re glad these million people won’t be losing their coverage for now, but what about everybody else who isn’t exempt? These are the challenges of implementing a terrible law. The administration is going to be swamped with legitimate pleas for relief from its heavy-handed regulations that are causing massive dislocations throughout the health sector and employer community. At issue this week are “mini-med” plans that offer access to routine care but limited protection from major medical bills. Health and Human Services gave waivers to about 30 big employers, insurance companies, and unions from rules that phase out annual limits on coverage for these limited-benefit plans. And this is only the beginning. The next huge hurdle will be the government’s regulations on how much insurers must spend on medical care versus administrative overhead — and what costs and services fit into each category. If the rules are too strict, millions more people will find their insurance doesn’t meet federal rules. This truly is the tip of the iceberg that could sink the ship of private health insurance. WSJ Editorial: The Wall Street Journal was compelled on Thursday to publish an editorial entitled “ObamaCare and the Elections” to help build a fire under Republicans who are skittish about repealing the overhaul law. Rasmussen Reports says that support for repeal fell to its lowest level since polling began in March, with “only” 50% supporting repeal. That could well be because the news has been filled with talk of the early sweeteners put into the law specifically for the purpose of making it appear more appealing. All most people know so far about the law are these early benefits. But they can’t hide the tsunami of damage that is yet to come — with countless employers seriously considering dropping coverage and sending employees into the tax-funded exchanges, a mountain of debt from federal and state entitlements, the CLASS Act Ponzi scheme, more waves of lost Medicare Advantage coverage, $500 billion in new taxes that will be passed along to consumers in the form of higher medical costs, and ever-rising health insurance costs to keep pace with the expensive new federal mandates. Not to mention the despised individual mandate, fines, and penalties for not buying expensive government-mandated insurance. The job of the next Congress will be to do its due diligence in making sure the American people understand what is coming if this law does go into effect. Court ruling: A federal judge in Michigan has dismissed one of more than 15 legal challenges to the new health care law, claiming the law is indeed constitutional. Judge George C. Steeh of Federal District Court in Detroit, appointed by former President Clinton, decided the individual mandate is needed to compel Americans to obtain health insurance. Basically he said that the other provisions of the law — such as requiring health insurers to sell policies to all comers — make the individual mandate necessary. Steeh said that without the individual mandate, consumers would have every incentive to wait until they get sick to buy coverage. This generated a slew of comments to The Hill’s article about the ruling, with wondering why 30 companies can get exemptions, but not the rest of us. The Obama administration cheered the ruling. The Thomas More Law Center that brought the case vowed to appeal. Two other cases with higher profiles, one in Florida and one in Virginia, are headed toward hearings on issues involving the constitutionality of the individual mandate and the reach of the federal government’s power through the Commerce Clause of the Constitution. The central question, which likely will go before the U.S. Supreme Court, is whether the Commerce Clause gives Congress the authority to require citizens to obtain a commercial product, namely health insurance. The judge in the Florida lawsuit, which was filed by elected officials in 20 states, is expected to allow a hearing on the merits on Dec. 16. The Virginia case is scheduled for a hearing on Oct. 18. Medicaid briefing: Our briefing yesterday in the U.S. Capitol on the Impact of ObamaCare on the States, jointly sponsored with the Institute for Policy Innovation with Merrill Matthews, was important and informative. ALEC Health & Human Services Task Force Director Christie Herrera’s PowerPoint offers a good overview of this important issue, and Marc Kilmer of the Maryland Public Policy Institute and John R. Graham of the Pacific Research Institute offered important insights about the detrimental and costly impact on their states. As many as 25 new governors will be elected on November 2, and all will be faced with billions of dollars in additional costs to implement a health overhaul law that many of them will have campaigned against. And the costs will compromise their ability to meet other vital state needs in funding education, transportation, and public safety. Even the son of Senate Majority Leader Harry Reid acknowledged as much during a gubernatorial debate in Nevada last night. Democrat Rory Reid said “there is potential for [the health law] to put significant pressure on states because Medicaid rates [sic] could go up significantly” — at a time when many states, including Nevada, are struggling to maintain their existing Medicaid programs. Not a good sign when the Majority Leader’s own son starts dissing the law. In this audio clip, Grace-Marie Turner discusses the health overhaul law — its passage and its implications — with Real Wealth Podcast. This fall, the U.S. Supreme Court will settle a longstanding debate whether doctors in training, better known as medical residents, are “students” or “employees” of their respective institutions, Fodeman writes. The Federal Insurance Contribution Act (FICA) specifically provides an exemption from Social Security taxes for “service performed in the employ of a school, college, or university” by a “student who is enrolled and regularly attending classes at such school, college, or university.” Medical residents have historically qualified for this exemption, but in 2005 the Treasury Dept. passed a regulation excluding anyone working forty hours or more per week from meeting the definition of “student.” The government’s arbitrary forty-hour work week to qualify as a student doesn’t pass muster, Fodeman writes. When sleep-deprived medical residents receive their hard-earned paycheck, the terminology has significant financial implications. The Supreme Court should rule that medical students are indeed students and thus should qualify for the FICA Student Exemption. Dr. Fodeman discusses the looming physician shortage on a radio interview with WTIC News Talk 1080. Grace-Marie Turner joined the Grandy Group on WMAL to discuss the latest wave of seniors losing their Medicare Advantage plans in 2011. 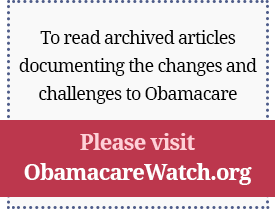 Republicans ought to be using the 2010 campaign to build opposition to ObamaCare and educate voters about the differences between private and government health care, The Wall Street Journal writes. They could also begin persuading the public — and maybe even themselves — of the virtues of an alternative system based on market principles and more consumer choice. Republicans have made intellectual progress on health care since the 1990s, but it remains outside their political comfort zone and certain (or shall we say uncertain) Members still believe the issue is a loser. Yet ObamaCare has scrambled everything. Republicans will need a reform alternative and a coherent health care philosophy, and the time to start shaping it is now, so that voters can see how future decisions will be made according to a set of principles they can understand. Another epic health care debate is inevitable whether Republicans like it or not, and the time to being the counterrevolution is now when voters are paying attention to their arguments. Just in time for the mid-term elections, the Department of Health and Human Services has issued waivers of the new health overhaul law to 30 companies, covering almost a million workers, so that companies can keep their health plans for another year. In order to comply with the health overhaul law, plans are becoming more expensive, and companies are considering whether to drop them. You can’t you’re your plan if your insurance company drops it. Rather than granting waivers to 30 companies for one year, HHS should save time and simply grant waivers to all companies indefinitely. Then will Americans truly be able to keep their plans if they like them. Miller discusses his appearance several weeks ago on a panel at a “Prescription for Growth” event organized by the National Journal, which focused on whether the health overhaul law will accelerate growth in health-related sectors of the economy and whether the right jobs are being created. Miller pointed out that it should not be surprising that, when one predicts that the future will look like the recent past and its lagging statistics, a health sector that consistently grows several percentage points faster than the rest of the economy and remains very labor intensive should be expected to produce a significant number of “new” jobs. However, even the net increase in health spending projected for the supposedly budget-deficit-reducing PPACA remains relatively modest over the next decade. So while the Obama administration roosters can crow about the appearance of what already was likely to happen over the next decade in predictable places on the jobs front, even the value of such standard forecasts should be taken with more than a few grains of salt. Six months after passage of the health overhaul law, there is no longer any credible, coherent argument that the law will make health care more affordable for small business — now, next year, or anytime in the foreseeable future, Graboyes writes. Since passage, each month has brought more bad news for those who hoped or argued that the law would bring down costs. Now and then, a stray “healthcare reform will help small business” study comes over the transom. But thus far, the underlying assumptions of such studies have always been contradicted by the unpleasant facts rolling out each month. Looking forward, there’s every reason to believe that small business will see an environment of higher premiums, greater administrative burdens, vanishing options, and endless surprises. The state health insurance exchanges created under the health overhaul law are the chief method by which the federal government will exert control over the insurance marketplace, Suderman writes. In theory, they will expose health insurance customers to greater competition while protecting them through regulation. In practice, they will likely prove difficult to design and implement, and may ultimately undermine the country’s quality of care. Meanwhile, there’s evidence that the sort of government-managed competition fostered by exchanges does little to prevent adverse selection. In ObamaCare’s exchanges, which force insurers to take all comers and charge similar prices regardless of health history, pressure to avoid the sick by any means will be fierce. Squeezed by federally required regulations, insurers will certainly compete — but only to avoid the sick. Patients are being denied potentially better, more timely treatment because of a National Health Service culture that demands loyalty to the family of the NHS hospital providers, according to the London-based Civitas. Based on a year-long study into the relationships between acute trusts and their commissioners, the report concludes that NHS providers use their muscle and connections to keep providing services even when faster, higher quality care is on offer elsewhere. The results are that the benefits of a decentralized and innovative NHS are being denied to patients who have to wait longer for treatments and fail to access the most appropriate services. The study did find isolated examples of the market having significant positive effects on quality, efficiency, innovation, and patient focus, but, by and large, the ‘NHS family’ has broken competitive, lower-cost and higher-quality alternatives, keeping the benefits of innovation and accountability limited. Edited by Merrill Matthews, Ph.D.
Six experts discuss the intellectual property issues surrounding biologics and their generic versions, biosimilars. The health overhaul law effectively addressed these issues, but it did a poor job of establishing a clear abbreviated approval pathway for biosimilars in the near future, Matthews writes. That failure could raise serious concerns about the FDA and its recommendations, especially the question of whether its decisions are guided strictly by safety and efficacy, or whether costs will play a role. Prescription drugs are not to blame for the unsustainable growth of government health spending in Canada, according to a study from the Vancouver-based Fraser Institute. The study shows that prescription drugs accounted for only 8.8% of total government health spending in 2009; patented drugs accounted for only 5.5%. After spending on drugs is subtracted, all remaining areas of health care accounted for 90.8% to 91.2% of total government health spending between 2006 and 2009. It is a mistake for policymakers to engage in top-down cost containment strategies targeting the individual components of health care spending. The report concludes that the actual cause of unsustainable growth in government health spending is the flawed design of government health and drug insurance programs, not the price of medical treatment or the introduction of new medical technologies. Former FDA official Peter Pitts writes in SignOnSanDiego that the biopharmaceutical industry is an important source of 21st century jobs and medical innovation. Through 2008, during the worst recession in more than a generation, the biopharmaceutical sector grew by 1.4 percent, he writes. At the same time, total private-sector employment went in the opposite direction, declining 0.7 percent. Without the robust growth of biopharmaceutical companies, the recession would have been even worse. America dominates biopharma. In 2007, more than 2,700 drugs were under development in the United States — compared to just 1,700 throughout the rest of the world. Biopharma directly employs almost 700,000 people and supports 3.2 million American jobs in total. These are good-paying jobs, too. The average salary in the biopharmaceutical sector was $77,595 in 2008 – $32,000 more than the average private-sector job. In order to make sure that these innovative companies can succeed, our leaders must maintain a level economic playing field. Excessive taxes and an onerous regulatory environment will discourage new businesses from sprouting up — and will prompt more established actors to seek friendlier climes abroad. And the United States must resist the temptation to forcibly limit the price of drugs which will stifle innovation and investment. Grace-Marie Turner will speak about “What real health care reform looks like” on Saturday at 12:00pm.